Supply chains are highly complex systems, and disruptions may ripple through these systems in unexpected ways, but they may also start in unexpected ways. We investigate the causes of ripple effect through the lens of systemic risk. We derive supply chain systemic risk from the finance discipline where sources of risk are found in systemic risk-taking, contagion, and amplification mechanisms. 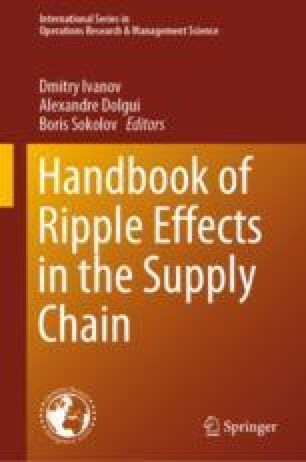 In a supply chain context, we identify three dimensions that influence systemic risk, the nature of a disruption, the structure, and dependency of the supply chain, and the decision-making. Within these three dimensions, there are several factors including correlation of risk, compounding effects, cyclical linkages, counterparty risk, herding behavior, and misaligned incentives. These factors are often invisible to decision makers, and they may operate in tandem to exacerbate ripple effect. We highlight these systemic risks, and we encourage further research to understand their nature and to mitigate their effect.